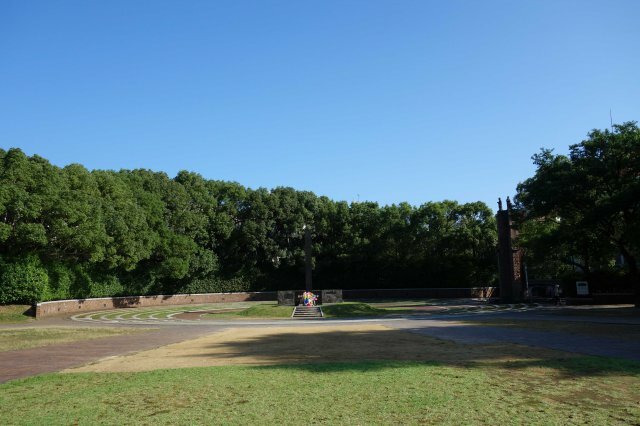 Nationally Designated Historic Site "Nagasaki Atomic Bomb Historic Ruins"
The Nagasaki Atomic Bomb Ruins convey the damage caused by the atomic bomb which was dropped on Nagasaki on August 9th, 1945. They are made up of the hypocenter, the former Shiroyama National School Building which was exposed to the atomic bomb, the former belfry of Urakami Cathedral which fell into a river below a cliff, the gatepost of the former Nagasaki Medical College which became inclined in the blast, and the second torii gate of Sanno Shrine which was reduced to a single pillar in the blast. They were designated as a National Historic Site on October 3rd, 2016. Read the message from the Mayor. 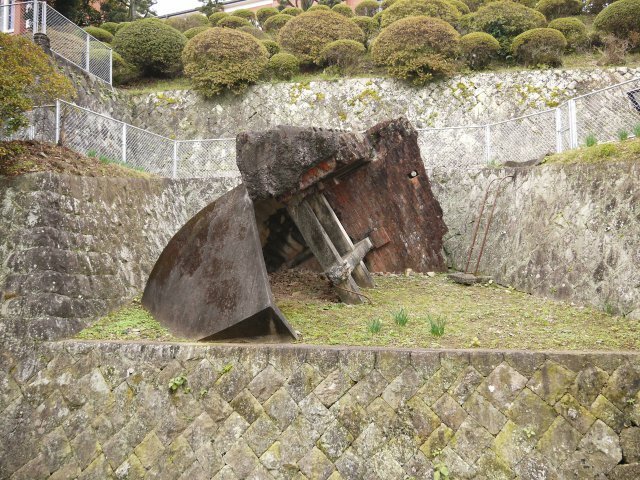 The exact position of the hypocenter, which refers to the area directly below where the atomic bomb exploded in the air, has continued being discovered. As a result, the estimated location of the "hypocenter" is within the Prayer Zone area of the Peace Park (Also known as Hypocenter Park). The layers of earth remain in the Hypocenter Park so as to show the destructive power of the atomic bomb. The land around the layers of earth used to slant to towards the south but was altered by the explosion of the atomic bomb and became the flat land it is today through construction and soil preparation of the area. The former Shiroyama National School Building is located approximately 500m west of the hypocenter. At the time of the bombing, two three-story reinforced concrete school buildings stood parallel to each other, The interior of both the north and south buildings was destroyed and the 2nd and 3rd floor of the north building was completely burned. Due to changes over the years, the majority of the school building was demolished around 1980, however, the stairwell of the north building still exist today. Wooden blocks which were embedded into the concrete frame work for the interior design of the building remain burned and are especially known as evidence of the damage from the extremely hot fire. Urakami Cathedral is located approximately 500m northeast of the hypocenter. The cathedral made of bricks collapsed due to the atomic bomb and left behind just a mere wall. The cathedral has belfry domes on both of its towers. The one on the south side fell into the inside of the cathedral and the one on the north fell into a river below a cliff. This belfry made of reinforced concrete is 5.5m in diameter and is estimated to weigh about 50 tons. Urakami cathedral was demolished in 1958 and rebuilt the next year. The belfry is a valuable of Urakami Cathedral which conveys the reality of the atomic bomb. The atomic bomb took the lives of 890 faculty members and students at Nagasaki Medical College, located approximately 700m southeast of the hypocenter. The majority of its buildings collapsed or burned. 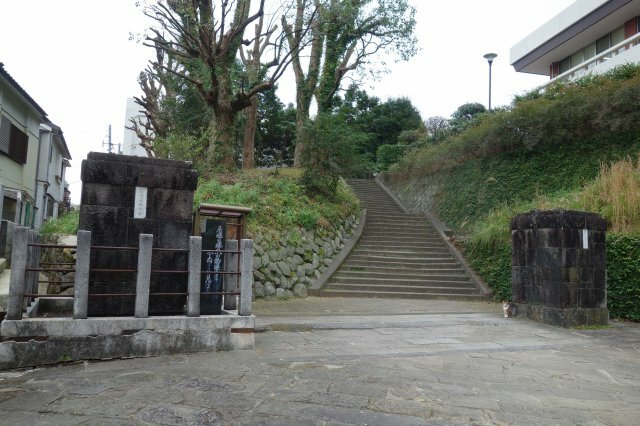 The main gate of the former Nagasaki Medical College was made up of two stone-built gateposts, and two concrete inner pillars. 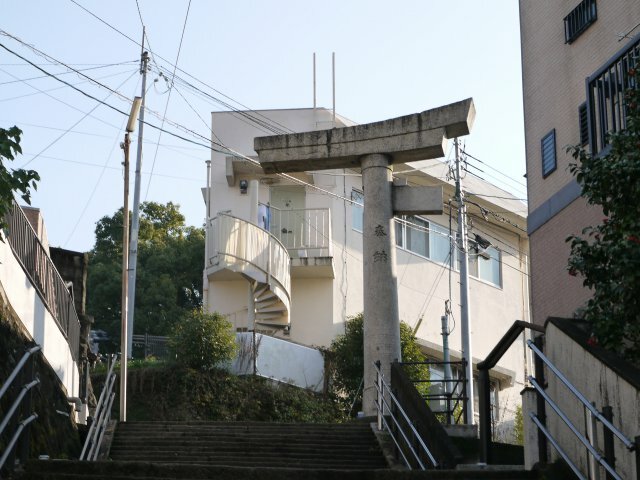 Due to the atomic bomb, the pillar of the gatepost on the south side which read "Nagasaki Medical College" slanted 9cm horizontally from the base and a 16cm gap at maxium between the pillar and the base was formed. On the other hand, the pillar of the gatepost on the north side which read "Nagasaki Medical College Pharmaceutical Department" did not show signs of slanting from base. 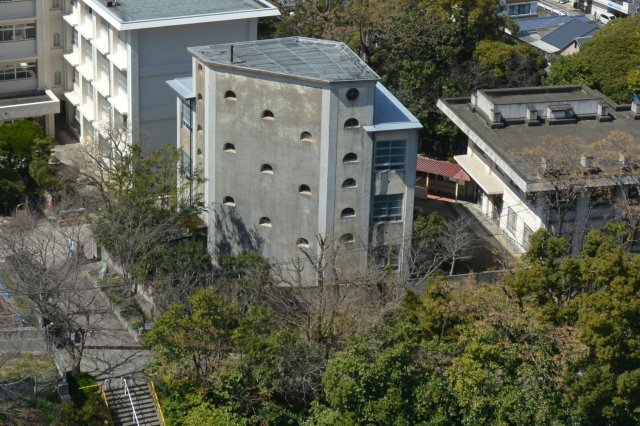 It is suspected that the plateau formation of the hill which Nagasaki Medical College's campus was located on lessened the extent of the damage received from the blast of the atomic bomb. Sanno Shrine is located approximately 800m southeast of the hypocenter. The shrine office, worship hall, hall of offerings, and the main hall along with its historical documents and treasures were destroyed or burned. Further, the 3rd and 4th torii gate also collapsed. The top of the southern pillar of the second torii rotated 13 degrees east and the north pillar collapsed. The surface portion of the remaining southern pillar which was facing the direction of the hypocenter is peeled due to the heat rays.